Sisters in Crime Australia will celebrate its 25th Scarlet Stiletto Awards for best short stories with a gala ceremony at Melbourne’s Thornbury Theatre on Saturday 24 November, 6 for 6.30pm. Almost $10,000 is on offer in prize money with the first-prize winner also taking home a spectacular scarlet stiletto trophy. The awards will be presented by Kate Atkinson, star of Wentworth and Cate Kennedy, short story guru, with crime author and performer Jane Clifton compering. Kate Atkinson has a long criminal record – on the acting front. This year she received a Logie Award nomination for Most Outstanding Actress in a Leading Role for her portrayal of Governor Vera Bennett in the Fremantle production of Wentworth. Kate has acted in many of Australia’s favourite series. 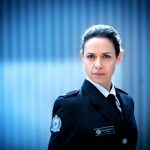 Her most recent ongoing role was in Jack Irish; other series include Rush, The Dr Blake Mysteries, Miss Fisher’s Murder Mysteries, Blue Heelers, State Coroner and the much-loved SeaChange, giving a memorable portrayal of Constable Karen Miller. Before presenting the major Scarlet Stiletto awards, Kate will talk to Jane Clifton about her life in crime. 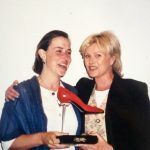 Cate Kennedy, winner of the first two Scarlet Stiletto Awards, will make a short presentation – ‘”These heels are made for walkin’’ – about how this recognition transformed her life. Back in 1994, Cate, then working at the Daylesford Library, laboured for weeks on her entry. She then quickly knocked off a second story – just for fun -and entered both. It was that second story that won First Prize; although her first-one was commended. “This single event set me on a path which hasn’t petered out yet. What made the difference was the attitude of the women I met in the Sisters in Crime. They seemed to just assume I’d be writing more, and that basic faith in my writing did more for my confidence,” Cate said. Cate took out First Prize again in 1995, and a second entry of hers won Third Prize. With such talent already showing its colours, Sisters in Crime’s convenors decided on a ‘two strikes and you’re out’ rule – to give other (new) women writers a chance to shine. It’s now become the goal of every shoe winner to earn their ‘pair’. Four other authors have won two shoes – Christina Lee, Janis Spehr, Josephine Pennicott and Ros Bent – though to date only Cate has a matching pair. 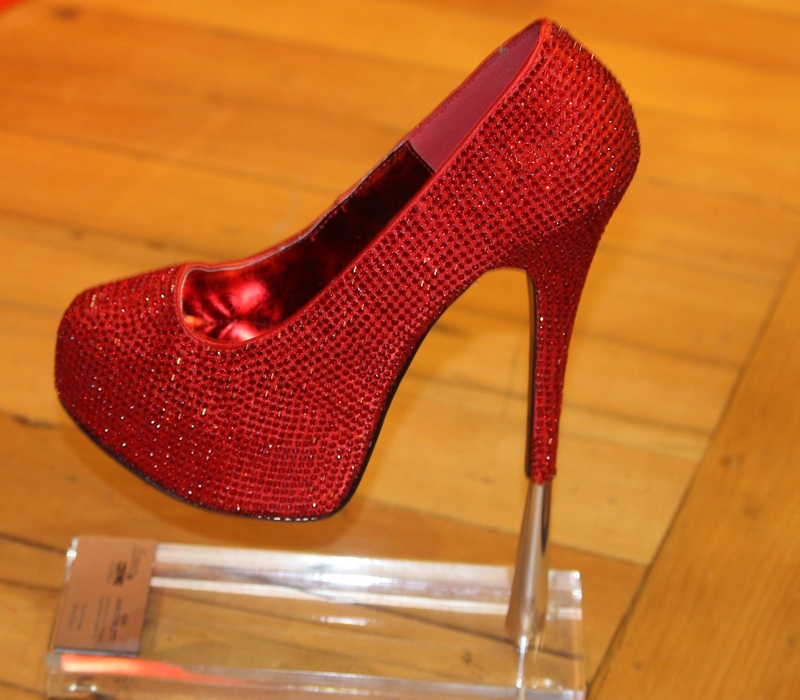 Two-time shoe winners are invited to become judges of the competition. Cate will also present framed certificates to this year’s shortlisted authors and launch Scarlet Stiletto: The Tenth Cut (Clan Destine Press), an e-book of this year’s winning stories. Since discovering her mojo in a matching pair of scarlet stilettos, Cate has written The World Beneath (Scribe, 2009), which won the NSW Premier’s Prize for Literature People’s Choice Award, and has been published in the UK, North America, France and China. She has also written three collections of poetry; a memoir about volunteering; and two short story collections: Dark Roots (Scribe, 2006) and Like a House on Fire (Scribe, 2012). She still loves crime fiction, and is still trying to write it. The awards have springboarded the careers of many writers. To date, 3471 stories have been entered with 25 Scarlet Stiletto Award winners –including category winners – going on to have novels published: Cate Kennedy, Tara Moss, Annie Hauxwell, Angela Savage, Josephine Pennicott, Ellie Marney, Aoife Clifford Sarah Evans, Inga Simpson, Alex Palmer Liz Filleul, Margaret Bevege, Patricia Bernard, Bronwen Blake,Jo McGahey, Cheryl Jorgensen, Kylie Fox, Simmone Howell, Emilie Collyer, Sandi Wallace, Amanda Wrangles, Lois Murphy, Janis Spehr, T J Hamilton and Anna Snoekstra. This year 201 stories have been in contention with 23 authors from all over Australia shortlisted: Beth Amos (ACT); Susan Bennett (VIC); Robyn Boston (QLD); Jan Bull (VIC); Jenny Castles (VIC); Kat Clay (VIC); Dawn Farnham (WA); Bridgette Cummings (SA); Olivia De Lesantis (VIC); Alison Ferguson (NSW); Cristine Goonrey (NSW); Annie Hauxwell (VIC); Philomena Horsley (VIC); Kerry James (VIC); Kate Jenkins (TAS); Lisa Jordan (VIC); Lisa Louden (NT); Helen Richardson (NSW); Fin J Ross (VIC); Dorothy Shorne (VIC); Paulene Turner (NSW); Ellen Vickerman (QLD); Sandi Wallace (VIC). Tickets: $58 (no concession) event and dinner. Drinks available at bar prices. Men or ‘Brothers in Law’ welcome.